Until about a month ago, I thought that the analysis of climate change in Australia, and information given to the public and the government, was based on the raw temperature data. It is based on data that has been subjectively and manually adjusted. It makes no allowance for Urban Heat Island (UHI) effects. 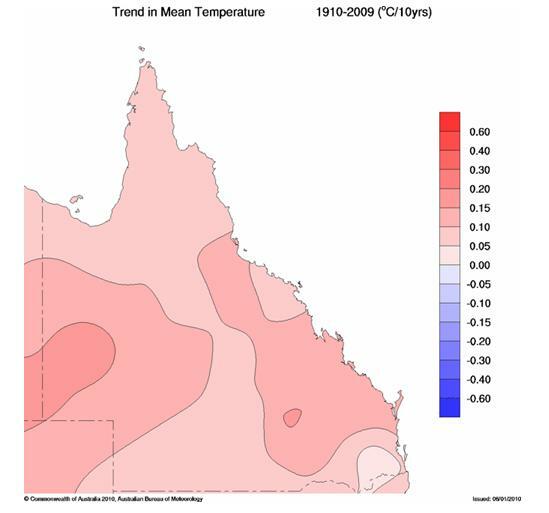 In Queensland, it produces a trend in mean temperatures that is nearly 0.2 degrees Celsius greater than the raw data does. It does NOT give an accurate record of Queensland temperatures over the last 100 years. For many years I have closely followed the weather forecasts, synoptic charts, and discussions of local weather, given by the Australian Bureau of Meteorology (BOM). The BOM has a place of honour in Australia and performs a sterling service in times of cyclone, flood, bushfire, and other crises. Naturally their forecasts are taken with a grain of salt, but generally BOM is respected as an impartial scientific organisation. In previous posts I have contrasted the treatment of data by the Goddard Institute of Space Studies (GISS) with the published data provided on the BOM website. However, the 15th March State of the Climate Report by BOM and CSIRO pricked my interest with its claims of warming in some places up to 2 degrees C in 50 years. The temperature record which can lead to these two interpretations is the subject of this study. I should also acknowledge janama who alerted me to the 1996 adjustments by Torok and Nicholls (1996) and provided me with quantities of information, including a copy of the Torok paper. The HQ page gives some useful background information about the dataset. Basically, the method(s) used are as follows: candidate stations are assessed for data quality, i.e currently open with more than 80 years of data (often created by combining sites), then surrounding “reference” stations are selected for comparison. Preferably at least 10 are required that are highly correlated with the candidate station, not at risk of becoming urban (>10,000 population), within 8 degrees latitude and longitude and 500m difference in elevation- and, Torok specified, in the same climatic area e.g. not over a mountain range. In 1996, this produced 224 stations. By 2004, this had been reduced to 138, of which 39 were urban. The results of the two methods were compared. The resulting series was manually checked for discontinuities (abrupt changes between the reference series and candidate data) and subjective decisions were made whether to make adjustments and by how much, by referring to the metadata (information about station history) which is not always available. One example of metadata (Roma) is given below. 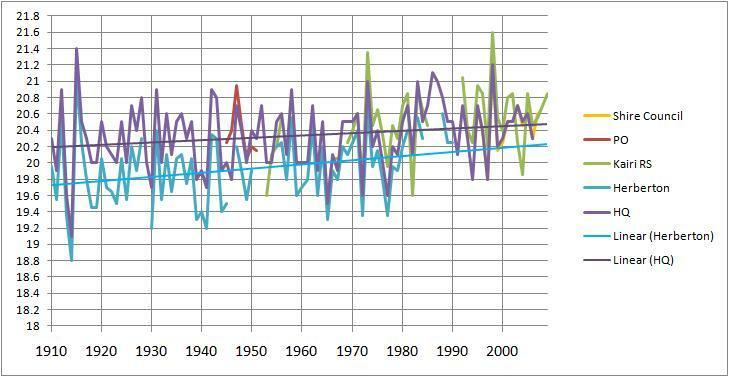 “Overall, the updated dataset includes an average of approximately six adjustments per record since 1910.” (Della-Marta et al) Every station record was adjusted. From this dataset, temperatures for areas up to 740km away are assumed and used to create the trend maps. GISS uses stations up to 1200km away; BOM uses stations up to 8 degrees latitude and longitude and 500m difference in altitude, but not from a different climate type eg over a mountain range, and not if at risk of urbanisation. No list of stations used is supplied. In other words, they use a grid that is 16 degrees x 16 degrees centred on each station. GISS say their process is automatic; the BOM adjustments are made manually after visually checking for discontinuities, then deciding whether and how much to adjust. BOM says it does not include urban sites in formulating the HQ climate record whereas GISS does. Moreover, the papers cited specifically state that sites are urban and therefore not to be included, if they have had a population over 10,000 at some time in the last 100 years. This applies to the records from Cairns, Rockhampton, and Gladstone Post offices. Therefore, the methods used by Torok et al and Della-Marta et al are not uniformly applied by BOM. A further potential difficulty is that in both processes (1996 and 2004) reference stations i.e. sites used in the adjusting process, could have as little as 10 years of monthly data. This statement will be the yardstick for this study, starting with Queensland. As the survey progresses to cover all of Australia this will be updated. I downloaded annual mean maxima and minima for each of the sites from BOM Climate Data Online, calculated annual means and plotted these. Frequently, two or three stations (some closed) were needed for the entire record from 1910-2009, and even then there sometimes were gaps in the record- e.g. from 1957 to 1964 many stations’ data has not been digitised. (But 8 years of missing data is nothing- Amberley and Atherton have over 30 years that have been “filled in” to create the High Quality series). I also downloaded the annual means from the High Quality page, and plotted them. I then added a linear trend for each. Because there are 100 non-urban sites across Australia, I plan to analyse the network in stages, beginning with Queensland. Future posts will look at the Northern Territory and northern Western Australia, and then other states. From 1910 to 2009, the linear trend is 1 degree Celsius per 100 years. This is the map of Queensland High Quality sites. I have added the trend per 100 years for the raw data (green) and the adjusted data (blue). Note that Urban sites are not included in developing time series graphs or trend maps. Note: There are 8 east coastal sites. Only 4 sites are semi coastal, i.e. between the east coast and the Great Dividing Range (Amberley AMO, Gayndah, Rockhampton AMO, Charters Towers). The remaining 16 are inland of the Dividing Range, and Normanton, which is close to the Gulf. Graphs for all sites in Queensland are in the Appendix in alphabetical order . This is a table showing for each site the unadjusted trend, the adjusted trend, the difference, and the mean for each series. Note: The adjusted trends average at 0.95C. Round to 1 degree C per 10 years, which is that shown on the timeseries graph. The raw data trend is 0.78C- a not insignificant difference. The total difference is +4.75C. 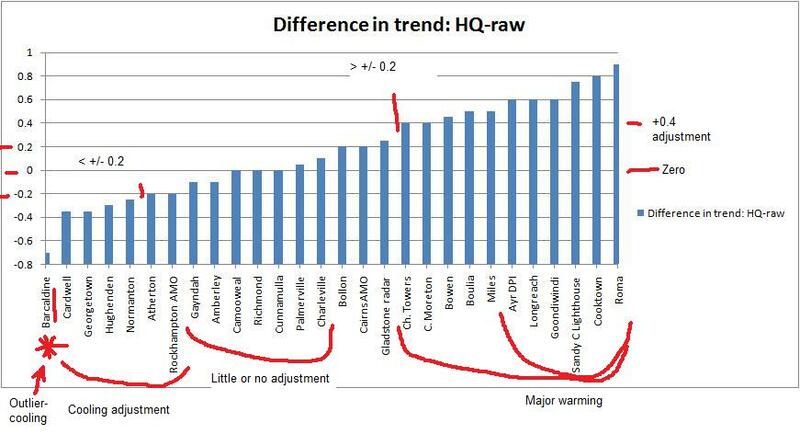 Barcaldine is an obvious cooling outlier. There is an obvious warming bias. 11 sites have a warming of 0.4C or more. 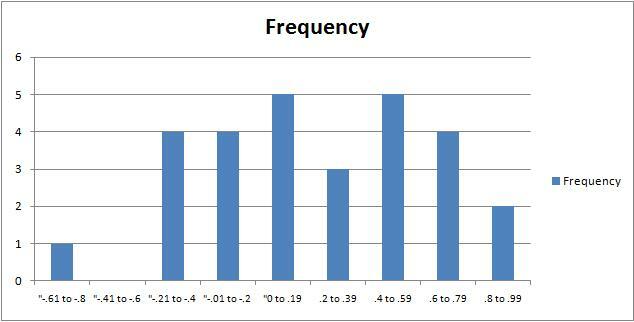 Yes, my trend estimates must have a possibility of error- say + or – 0.1 degrees for raw data and for adjusted data. 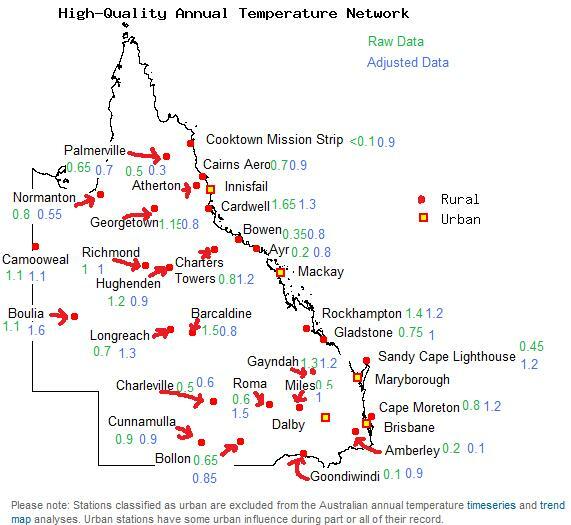 The total error could be +/- 0.2 C. There are 5 sites with cooling > 0.2C, and 12 sites with warming > 0.2 C.
I am particularly interested in the outliers- Cooktown , Ayr DPI, Barcaldine, Longreach, Goondiwindi, Sandy Cape Lighthouse, Roma. I have made a manual “splice” of the raw data in a number of these. I make no claims of superiority- these splices are not better, but they show an alternative interpretation. Cooktown Mission Strip adjusted: from flat to 0.9 C warming. Ayr DPI. Ayr had a station at the Shire Council until 1984 and the DPI research station just out of town from 1952. I spliced the two. Compare with HQ. Once again, data up to 1952 has been seriously adjusted down. But Longreach, just 110km west, has a huge warming adjustment! First, Longreach’s record- Post Office and Aerodrome. Why do Longreach and Barcaldine differ by so much? It looks like they have been averaged. My money is on the raw Longreach record. Goondiwindi splice vs HQ: from 0.3 to 0.9C/100 years! Sandy Cape Lighthouse: from 0.45 to 1.2C warming. But the nearby stations of Maryborough, Gympie, and Childers are closer to the raw data! Nearby towns (see Appendix) of Surat, Mitchell, Injune, Miles, and Dalby don’t show this: Mitchell’s trend is at most 0.9C. Surat and Injune (from 1938 and 1968 respectively) mirror Roma’s temperatures fairly well, a little above and below. Miles shows a trend in raw temperatures of 0.5C, and Dalby (urban and therefore not included) 0.55C. 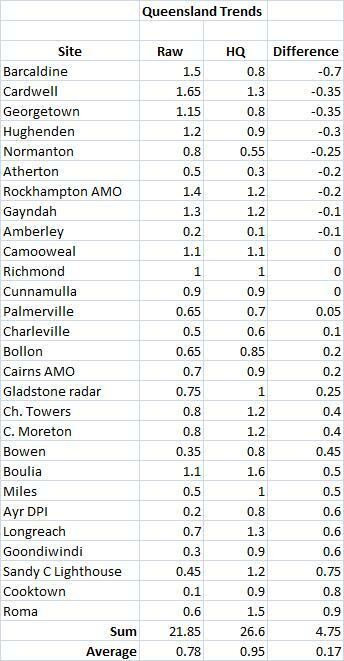 And to the west, Charleville’s adjusted data shows less than 0.6C. “Here is the raw and corrected data for Roma. The site has moved a number of times and the screen has changed. Here is the list of changes to the site which are related to the corrections. The main change relates to a major site move which accounts for a large part of the inhomogeneity. 12/1908: Screen moved due to building. 10/1916: Poor observations during the 1910s. 11/1929: Screen moved 50 feet due to new shed and incinerator. 10/1941: Screen needs to be repaired. 10/1962: Site has deteriorated due to bitumen and buildings. 01/1971: Temporary site during building. 09/1972: Move to new PO. 09/1983: Site moved 50 m south to better site. 01/1992: Move to composite site. 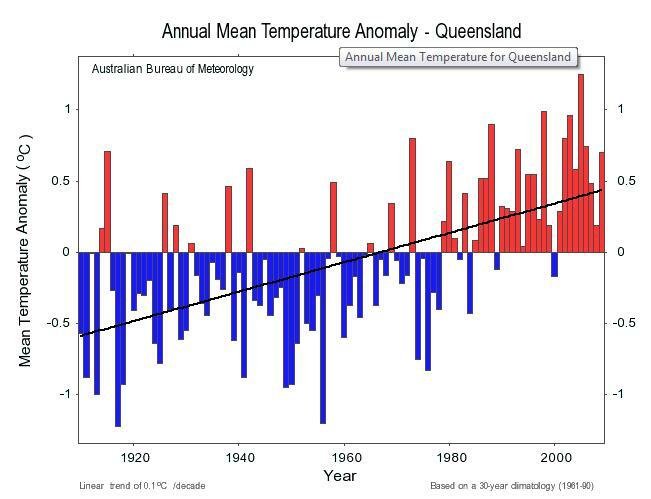 The High Quality data for Queensland shows a warming bias of nearly 0.2 degrees Celsius per 100 years. Comparison of the HQ data for these sites with the raw data shows unexplained inconsistencies in a number of cases. Leaving out the adjustments of the sites with the most glaring inconsistencies brings the average HQ trend back to the raw data trend of about 0.8 degrees C /100 years. Furthermore, it is based on data that has been subjectively and manually adjusted, and it makes no allowance for Urban Heat Island (UHI) effects. The methodology used either is not uniformly followed, or else is not used as described in the supporting papers, and appears to have flaws in quality control. It does NOT give an accurate record of Queensland temperatures over the last 100 years. However, the trend maps and time series graphs are based on it, so it is no wonder that they use cautious language. As far as Queensland is concerned, the only “High Quality” in the Australian High Quality Climate Site data is in the title. Here are the plots of the remaining HQ stations. Amberley Air Force Base– almost flat, but 30 years data filled in. A pity BOM doesn’t trust the RAAF before 1981. Atherton – 29 years of data filled in by using Herberton 10km away, over a range. Boulia: not warming enough already? Gayndah– about the same. I went to high school here in 68 & 69- a cold place in winter! I still like my splice better! Normanton: little change, but from mid 50s to 2000 a downwards correction. Jones, D.A. and Trewin, B.C. 2000. The spatial structure of monthly temperature anomalies over Australia. Australian Meteorological Magazine, 49, 261-276. Jones, D.A. and Trewin, B.C. 2002. On the adequacy of digitised historical Australian daily temperature data for climate monitoring. Australian Meteorological Magazine, 51, 237-250. Torok, S.J. and Nicholls, N. 1996. A historical annual temperature dataset for Australia. Australian Meteorological Magazine, 45, 251-260. Torok, S, Morris, C, Skinner, C, and Plummer, N. “Urban heat island features of southeast Australian towns” Australian Meteorological Magazine Vol 50, 2001. This entry was posted on May 12, 2010 at 4:38 pm and is filed under Uncategorized. You can follow any responses to this entry through the RSS 2.0 feed. You can leave a response, or trackback from your own site. Are you feeling warmer yet? The official archivist of New Zealand’s climate records, the National Institute of Water and Atmospheric Research (NIWA), offers top billing to its 147-year-old national mean temperature series (the “NIWA Seven-station Series” or NSS). This series shows that New Zealand experienced a twentieth-century warming trend of 0.92°C. The official temperature record is wrong. The instrumental raw data correctly show that New Zealand average temperatures have remained remarkably steady at 12.6°C +/- 0.5°C for a century and a half. NIWA’s doctoring of that data is indefensible. Yes, as Black Duck said, there is no reason for downward early adjustment and later upward adjustment except to produce an upward warming bias. Do they think we are fools to accept their claim that there is ‘zero impact’, simply because the pluses and minuses average out?. Great work Ken, I will follow this with interest. Can you back up with reliable data? 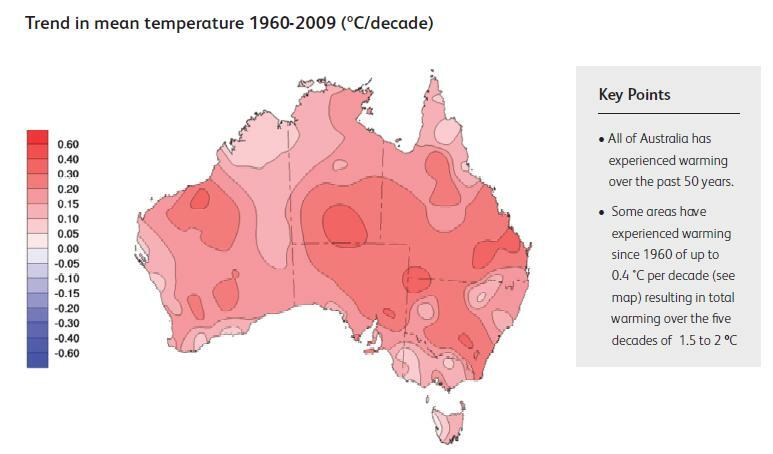 Anyone know of any other places other than The Australian Temperature Record: Part 1- Queensland kenskingdom? Preparing and looking for the right data and places is important when trying to start this, right? That’s how I ended up here anyway. The only “reliable” data is that supplied by BOM, which you see here. This is straight from their website and available to all, but you have to do a bit of digging. have a look at warwickhughes as well. Thanks Val! Very good read!